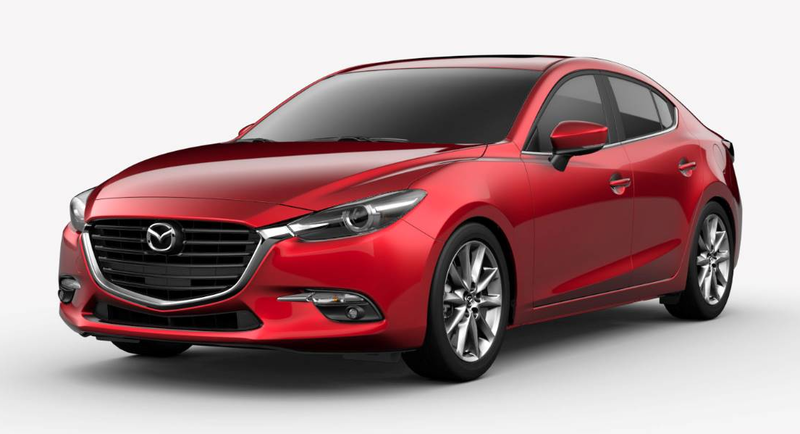 Hurry over to Island Mazda in Freehold, NJ to test drive the new 2018 Mazda3 Grand Touring. Every detail of the interior in the 2018 Mazda3 Grand Touring was designed to make driving better. From the instrument panel to the gear selector, everything was placed with intention and care to make your every move more intuitive. Why? To let you focus on what matters most: driving. The Mazda3’s sport seats are contoured to mold perfectly to the body, giving you and your passengers a more comfortable and connected ride, no matter how long the commute. The high-end sports seats-available in cloth, leatherette or dual-stitched leather-are as carefully crafted as they are beautiful. The Machine Gray Metallic paint makes the 2018 Mazda3 Grand Touring look as if it’s machined from a solid piece of steel. It starts with a black primer coat that’s covered with a precisely sprayed layer of aluminum silver paint. The process is highly controlled to ensure the coat’s aluminum paint flakes fall into a pattern parallel with the Mazda3’s body panels. This gives the black and silver hues more luminosity and a liquid reflective quality. Finally, layers of gray-tinted and colorless clear coating are applied to complete the premium look. Exhilaration has always run in the Mazda3 family. And the 2018 Mazda3 continues this legacy. The Mazda3’s already excellent performance and handling amplify the exhilaration with a precisely tuned 4-wheel independent suspension system. Plus, it comes with your choice of manual or automatic transmissions powered by spirited 2.0-liter or 2.5-liter SKYACTIV-G gasoline engines, with the 2.5-liter offering 184 horsepower and 185 lb-ft of torque. To instill the joy of driving into every Mazda, we engineer with a human-centric development philosophy. It’s how we created SKYACTIV-VEHICLE DYNAMICS with G-Vectoring Control. Mazda’s newest technology, SKYACTIV-VEHICLE DYNAMICS with G-Vectoring Control, helps you steer more precisely by optimizing load control. Just like an athlete refines his form to hit the ball further with less force, our technology strives for the same efficiency. Instead of strengthening the vehicle’s muscles, we improved how it delivers force so it can unleash its full potential. It works smarter, not harder, to make you feel connected and in control. Instead of focusing on the mechanics of vehicle dynamics, we started our development with people. Running countless studies on their characteristics and behaviors to design a vehicle that works harmoniously with the driver. The result? A car that feels like an extension of your body, with more precise steering, better control, and less fatigue. Our most technologically advanced Mazda is equipped with our most technologically advanced cabin. With MAZDA CONNECT, our next generation infotainment system, you get a host of entertainment and information options. All you have to do is pair your smartphone with the Mazda3 via Bluetooth to stream your favorite content. Mazda Connect makes staying informed and entertained effortlessly. Contact Island Mazda today to start your 2018 Mazda3 Grand Touring experience near the Freehold, NJ area.